Last night we thought the worst part of the storms was going to miss us. Then the sirens went off. I took the boys into the bathroom while hubby watched the weather. The sirens silenced so I thought we were in the clear. 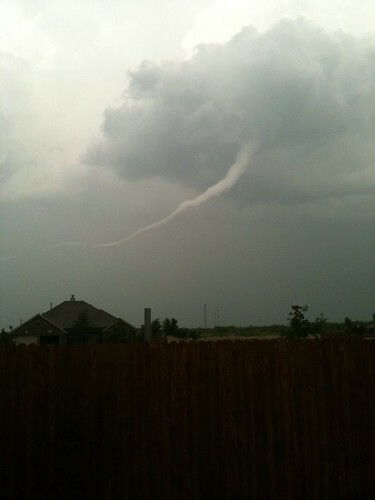 I was on the phone with my sister when she said she thought she saw a tornado. Hubby and I walked outside. We saw it briefly then it went back into the clouds. Back into the bathroom we went. We are all ok but there was a little bit of damage. (even from such a weak tornado) I am not sure if there was more than one or if everyone in our town had seen the same one. But here are a few videos and pictures from some friends in the area. (photo credit: Jennifer Wardlaw) She seemed to be the closest to it. This is where it caused the damage. You must live close to me! 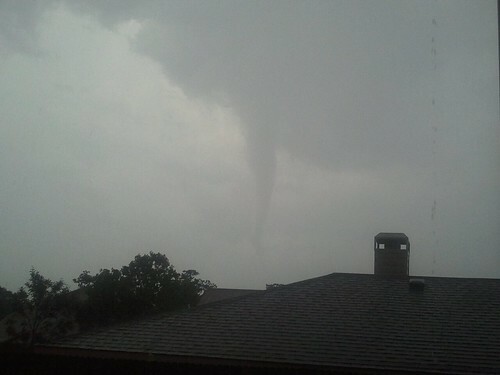 We got tornadoes last night too! That one in those videos looks familiar to the ones I saw last night posted by people on fox 4 news! I'm glad ya'll are okay! So glad you guys are ok! 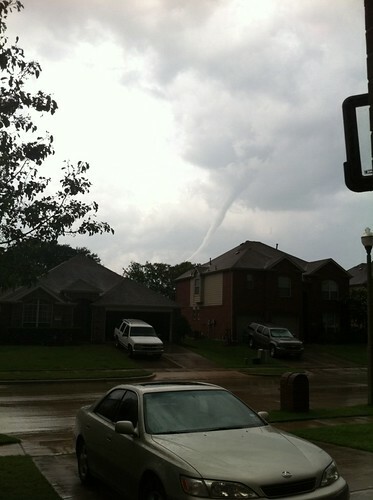 Tornados scare me like crazy. Stay safe!! Glad you are safe! Are you in Oklahoma or Kansas (or somewhere else...). So scary! I'm so glad you all are okay! ah! I was following you on twitter last night and I am amazed at that video! so glad you are ALL ok!!! This looks just like the one near Corinth, Texas...on that one the funnel cloud went over my place south of there and then our friends watched it go over their homes. Glad y'all are safe--our town always seems to get missed! That is very scary. :( I'm glad you all were safe!